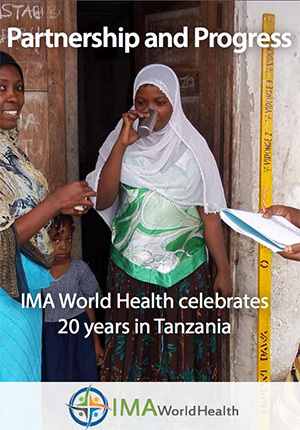 his year, IMA World Health is celebrating 20 years of work in Tanzania. In many ways, that celebration also recognizes the changes that helped IMA become the organization it is today. IMA was founded in 1960 to procure and distribute medical supplies to the developing world. But in 1995, then-CEO Paul Derstine took a bold step to start treating a disease — River Blindness — that became IMA’s first field project. As we look back, we can point to that moment as the turning point that helped make IMA a stronger organization and gave us the ability to have a greater impact on people in need. Looking back at the mid 1990s, the River Blindness Project was funded by 10 IMA Member Organizations along with Merck & Co. to create a truly partnership-oriented effort. It brought together faith-based, corporate, government and NGO partners. This partnership and collaboration became the foundation for the organization that IMA is today. 1994, Addressing NTDs — IMA partnered with several organizations, including the Tanzanian government, Merck & Co., IMA member organizations, and many others to develop a program to treat Onchocerciasis (River Blindness) in Tanzania through the distribution of Mectizan®. 2001, Burkitt’s Lymphoma — IMA began a program to battle Burkitt’s Lymphoma, a deadly and disfiguring childhood cancer. Dr. Glen R. Brubaker became the first medical doctor on IMA’s staff, and his main role was starting and supporting the program. To date, IMA provided treatment for over 4,500 children and trained 2,000 health care professionals and students to identify and treat the disease. 2004, AIDS Relief — A consortium of five U.S. organizations led by Catholic Relief Services, including IMA, was awarded a grant under the U.S. President’s Emergency Plan for AIDS Relief (PEPFAR) to provide medical care and treatment to people living with HIV/AIDS. IMA played a key role in supporting scale-up of care and treatment services for HIV in Tanzania. 2005, Orphans and Vulnerable Children — AIDS can devastate a family and leave children on their own. IMA’s Orphans and Most Vulnerable Children Project helped orphans and vulnerable children in Lushoto District of Tanzania’s Tanga region by providing free medical care and clean bedding materials, including mattresses, blankets and sheets. 2005, Home Based Care Project — IMA participated in a community home-based care (HBC) program to improve the health status and overall well-being of people living with HIV/AIDS. 2006, Capacity Project — The project created compatible human resources information systems that can be integrated and used to assist with national human resources for health planning and policy development, improve health care service provision and reduce disparities in service delivery between FBOs and public facilities. 2008, Malaria Program — With funding from USAID through RTI International, IMA provided monitoring and evaluation, and technical assistance to the Christian Social Services Commission (CSSC) in the effort to distribute malaria nets and increase access to IPT and ACT among children and pregnant women in 160 villages in southern Tanzania. 2009, Human Resources — Funded by USAID and led by IntraHealth, IMA provided technical assistance to CSSC for implementing the rollout of a nationwide human resource information system (HRIS) that will support all the faith-based and private sector health institutions in Tanzania. 2011, Envision NTD — IMA supported mass drug administration to combat neglected tropical diseases in 80 districts across 13 regions in Tanzania. More than 40 million treatments were delivered to more than 15 million individuals annually, and more than 50,000 community drug distributors, frontline health workers and teachers who deliver treatments received training. 2011, Cervical Cancer — IMA is working to stop cervical cancer in Tanzania through prevention, screening and treatment for those diagnosed early. IMA focused its initial efforts on Tanzania’s Mara region because of high HIV prevalence. HIV/AIDS increases the risk of developing cervical cancer. IMA’s work has now expanded into Mwanza region through technical support to CSSC. 2012, LEAD Project — The Local Partners Excel in Comprehensive HIV & AIDS Service Delivery (LEAD) Project is a successor of the AIDSRelief Project, with IMA continuing to work with districts and service delivery points to provide high quality prevention, care, and treatment services for HIV/AIDS. 2013, Morbidity Management for NTDs — IMA is working to address the pain and symptoms for those chronically infected by NTDs by providing lymphatic filariasis hydrocele and trachoma trachiasis (TT) surgeries for over 15,000 individuals in Lindi and Mtwara Regions. Read more about our history in Tanzania here. IMA celebrated the 20th anniversary of its work in Tanzania from 9 a.m. to 2 p.m. Feb. 18, 2015 at the Kilimanjaro Hyatt Hotel in Dar es Salaam, Tanzania. The Permanent Secretary of the Tanzanian Ministry of Health and Social Welfare Dr. Donald Mmbando was the guest of honor and gave the opening speech. IMA staff and long-time partners then discussed Integrated NTD Service and health systems strengthening with local partners.